This entry was posted in Tweetdumps on 27 Oct 2011 by Mike. Natural disasters create a surge of helplessness in those not directly affected. Many people want to do something concrete, something more than a quick donation or a Like on Facebook. Nowadays this desire to help can be harnessed by social media, but it’s easy to waste the time and goodwill of volunteers if this isn’t managed well. On October 5th 2011, the cargo ship Rena ran aground on a reef near Tauranga in the Bay of Plenty, a couple of hour’s drive from Auckland, New Zealand. It leaked 350 tonnes of fuel oil, which blanketed nearby beaches and killed or injured dozens of seabirds and seals, among them Blue Penguins (Eudyptula minor), the most common penguin species around New Zealand coasts. Thousands of volunteers went to Tauranga to help shovel oil-soaked sand, and veterinary specialists set up a facility for cleaning oil-soaked birds. The Rena spill was and is a national tragedy, and all around the country people wanted to know what they could do to help. 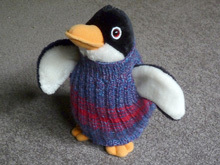 Back in 2000 a similar oil spill near Phillip Island, Australia, left many Blue Penguins oil-covered, and a bird rescue team through trial and error developed a little knitted sweater (or jumper, in Australian) that would keep penguins warm and stop them from preening oily feathers. The Tasmanian Conservation Trust organised a knitting drive, hoping volunteers could supply them with 100 or so. As often happens with unmanaged email requests, it was wildly over-successful: they ended up with 15,000. The Trust page now politely requests people stop sending them jumpers; they’re supposedly filling a small room somewhere waiting for a gigantic oil spill, but are actually being sold at the Phillip Island gift shop, adorning toy penguins. Six days after the Rena grounded, in a discussion forum on the knitting website Ravelry, one keen knitter posted the Australian penguin sweater pattern, and said a friend’s daughter was in contact with the bird rescue crew, and there were Blue Penguins in need of sweaters. A Napier wool shop, Skeinz, volunteered to receive completed sweaters and send them on to Tauranga. Having seen what happened in Australia, I created a Ravelry project page that anyone knitting could link to, partly to make a gallery of completed sweaters, but mostly so there was a single place that allowed control over the message and would let me notify knitters when enough had been received. My concern from the start was that we had no direct link to actual rescue workers: our only contact was the coordinator’s friend’s daughter, who was “in touch with” the veterinarians (note the similarity to that classic “friend-of-a-friend” setup we see in urban legends), and all communication was by two-stage mail, channeled through Skeinz in Napier. The coordinator at Skeinz then went on holiday, and the fun began. First the pattern was linked to by multiple different forums in Ravelry, and knitters from all over the world got busy. Then it started being emailed to knitters not on the network. Most critically, the call to action, full pattern, and mailing address were posted in the Skeinz online newsletter, where anyone could link to it, up to October 25th. And link to it they did: knitting blogs, conservation websites, the popular craft site Etsy, the Huffington Post, and the world’s most-read blog, BoingBoing. Hundreds of sweaters started flooding in, far outnumbering the rescued penguins. Skeinz was contacted by local and international media wanting pictures of cute penguins in sweaters. The organiser’s holiday coincided with a long weekend, so there was another delay in shutting down the campaign. But by now the horse had bolted, as the online newsletter content remained unchanged and was easy enough to copy and paste into emails; the penguin sweaters had gone viral. And by now it turned out that none—not one—of the sweaters was actually used. The rescued penguins were being kept in warm water and recovering under heat lamps, much less stressful for wild birds than dressing them in a cute knitted sweater. 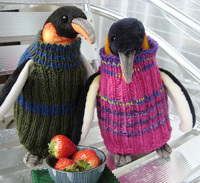 Nobody seems to have asked the vets and rescue workers if they in fact needed penguin sweaters, and those interviewed seemed a bit surprised by the international knitting effort. The end result is that “hundreds, possibly thousands” of unneeded sweaters will continue arriving at Skeinz. The organiser claimed, “the sweaters were a way for people to help, even if they weren’t going to be used.” Apparently the sweaters will be sent to a conservation group in Australia, though with crates of penguin jumpers already in storage it’s hard to see when they’ll ever be needed; some might be sold for unspecified fund-raising purposes. It all seems like rather a poor use of thousands of hours of volunteer effort: the knitters would have made more of a difference supplying gloves and hats for the volunteer clean-up crew, or donating a few dollars to Greenpeace, or writing to their MP with their views on maritime safety or offshore oil drilling. Knitters didn’t sign up to make sweaters for sale; they made them for penguins. Set up a dedicated website: say, using a WordPress blog (these can be updated from any computer) or even a Facebook fan page. Registering a domain name would help its credibility and make for more concise links. Make sure all URLs in tweets, emails, and forum postings point to that top-level domain name (e.g. www.volunteerproject.org), not an individual page with a knitting pattern (www.volunteerproject.org/whattoknit.html). Get the visible support of the group being helped: say, a short message and photo from them on the home page. 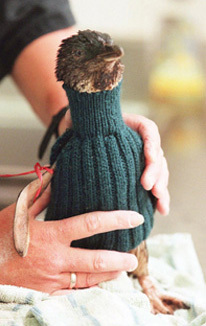 In this case, perhaps show a sweater actually being worn by an actual rescued Tauranga penguin. Most importantly, the group being helped should also have editing privileges for the site, so they can correct mistakes and add a news release as soon as any target is reached. Date-stamp everything, especially any page that might be linked to or emailed out of context. Add day-to-day updates on targets: the number of rescued birds, how many sweaters received, and so on, so volunteers can judge whether their effort is still needed. Keep any pattern or instructions from being emailed. Make the instructional text hard to copy and paste by embedding pictures and CSS styles, so it’s more convenient for a supporter to just pass on the page URL (write out the URL on the page itself and tell them to only mail this). Block search engine spiders so the pattern won’t be indexed (and cached) by Google, only the home page. The goal is to have the pattern existing in just one place, on that web page. Put the mailing instructions on a different page from the pattern, preferably the main page. Make sure this has a press kit link and instructions for media, in case the whole thing goes viral. And when the target is reached, put a big THANK YOU on the home page, post a gallery of the finished project (say, happy penguins in their sweaters), and… take the pattern down. UPDATE, 7 March 2014: The Phillip Island Penguin Foundation have changed their tune, and put out a new call for more sweaters, with predictably huge amounts of media coverage. They strongly imply in their advertising that this will save oil-soaked penguins (although there’s been no oil spill since 2001). If you read the fine print, you find out the sweaters will actually be sold in the gift shop. I guess “knit sweaters for us to sell in our gift shop” is not the sort of thing that goes viral. 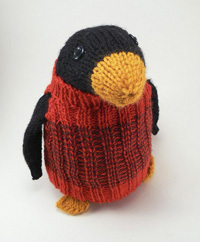 UPDATED UPDATE, 8 March 2014: The Penguin Foundation have added a paragraph (in a hurry, I presume, given it’s in a different font, with typos) to clarify they don’t need jumpers for actual penguins, and hey, isn’t this a great opportunity to work on your knitting skills! But all the media outlets and Facebook shares and retweets still seem convinced the jumpers are for saving oily penguins. This entry was posted in Social Media Douchebaggery and tagged Fave on 24 Oct 2011 by Mike. This entry was posted in Tweetdumps on 16 Jun 2011 by Mike. Auteurs are not like you and me. For example, the German director Werner Herzog is at first glance something of an eccentric. When you learn more about him, however, you realise he is not simply an eccentric, but an ECCENTRIC, written in foot-high capitals carved into an enormous granite boulder that has crushed our will to live. Recently there was a fad for listing fake facts about actor Chuck Norris: “When Chuck Norris does a pushup, he isn’t lifting himself up, he’s pushing the Earth down.” These even have their own website, novelty book, and amusing t-shirt. After reading a recent interview, I realised that one could compile a similar list of Facts About Werner Herzog. It would be just like chucknorrisfacts.com, except everything would be true. Werner Herzog was invited to guest star on The Simpsons, but asked for a DVD because he had never seen an episode. Werner Herzog saw Avatar, but didn’t care what happened in it. Herzog was once shot during an interview but rather than stop, tell the police, or get first aid, he kept speaking dourly. 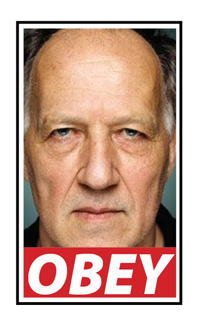 Herzog hates introspection so much he won’t look in a mirror and so doesn’t know the colour of his own eyes. To propose to his wife, Werner Herzog walked a thousand miles across the Alps, because that is what a manly man does. Herzog (unlike Oliver Stone) read the Warren Commission Report into the JFK Assassination. He quite enjoyed it. Werner Herzog only respects people who know how to milk a cow, and he can tell who knows how just by looking at them. Klaus Kinski and Herzog simultaneously plotted to kill each other; Herzog was about to firebomb Kinski’s house, but was too scared of his big dog. More people die in Werner Herzog’s movies than Chuck Norris’s if you count his crew. Herzog thinks of himself as a little girl in a fairy tale who steps out at night and holds open her apron and stars rain into it. If you were to put these on a t-shirt, I think Herzog himself would hunt you down, fix you with his pitiless gaze, and anatomise your sad buttonless-shirt-wearing hipsterness until you cried. This is, after all, a man who really believes the twentieth century was a mistake; the entire twentieth century. You wouldn’t like him when he’s angry. This entry was posted in Pointlessness and tagged Fave on 17 May 2011 by Mike. Never wear shoes you wouldn’t walk in for an hour. I ditched the car when I was halfway home. The Riccarton Road traffic was inching along, and walking was looking more and more sensible. I watched a stream of pedestrians straggling away from the shattered central city, where my apartment was. One I suddenly recognised. In fact, we’d broken up the day before. I pulled over and hugged her, these being, after all, exceptional circumstances. She had checked my apartment on the way out of town—it was standing and didn’t look damaged—and then she was off one way, me the other. At that point driving was becoming increasingly nonsensical, so I parked in a side street and set off home on foot. For some reason, I’d decided that morning to wear uncomfortable dress shoes, and soon regretted it. Never again will I wear shoes I can’t walk in should there be a natural disaster. I was on the ground floor, about to get my photo taken by a university PR person, when the earthquake shook us like a dog. I wish she’d gotten that shot, just to see the expression on our faces. I’m my workplace Health & Safety warden, and through a odd coincidence just a couple of hours before had attended a training session on what to do in case of an earthquake, so was able to busily usher people out from under tables and shoo them outside, checking each office for stragglers on the way. It wasn’t until we were all milling in the parking lot that I realised I’d left my phone in the building, along with my jacket, keys, wallet, ID, pocket knife, camera, and laptop: essentially, everything I need to exist. The next time evacuation, be it building, crashed aeroplane, or burning car, I ignore official instructions and grab jacket and bag on the way. At this point, there was no obvious damage to the university. One of the students asked me if lectures would be cancelled for the rest of the day. Probably yes, I said. We watched cars wobble back and forth in another aftershock, and I knew, with mounting anxiety, that my family and friends were probably all txting me right now. Getting on Twitter could tell us the magnitude of the quake and the amount of damage. Some of my workmates also were without keys or phone. After an hour of fruitless standing around, we decided it was worth a crack. “Please, we need to get back into our offices. One of my colleagues needs her medication.” The Facilities Management chap in his hard hat could probably tell I was lying, but, very much against the rules, he let us venture back inside to quickly retrieve keys and bags. The Learning Skills Centre then scattered to the four winds. An hour later, walking across Hagley Park after ditching my car, I saw the first photos of what was left of the Cathedral on my phone, and realised just how bad things were. The procession of people escaping the central city on foot had eerie echoes of 9/11, except these people weren’t covered in dust; we chatted as they passed, and I could tell some tourists the airport was closed, and also quite a hike, so they might want to stay put. Crossing the Botanic Gardens, a prodigy: the Avon River was flowing backwards from east to west. Signs and portents. I half expected a rain of blood. At that stage, I was ready to believe anything. (A week later I checked a map and realised I’d crossed the river where it looped back around, and this was the direction I’d seen it flowing all my life.) Only the ducks seemed unperturbed by the unusual day we were all having. 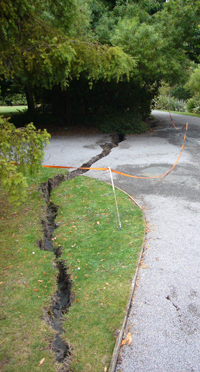 There is a feeling of sick anticipation as you first enter your house after an earthquake. Photographing my way from room to room, it was clear that there was hardly any damage. Pictures had fallen down, some of the cracks in the wall were a little bigger, but the place just needed a clean. And, well, electricity. I changed my shoes. This entry was posted in Shaky Premises on 4 Apr 2011 by Mike.